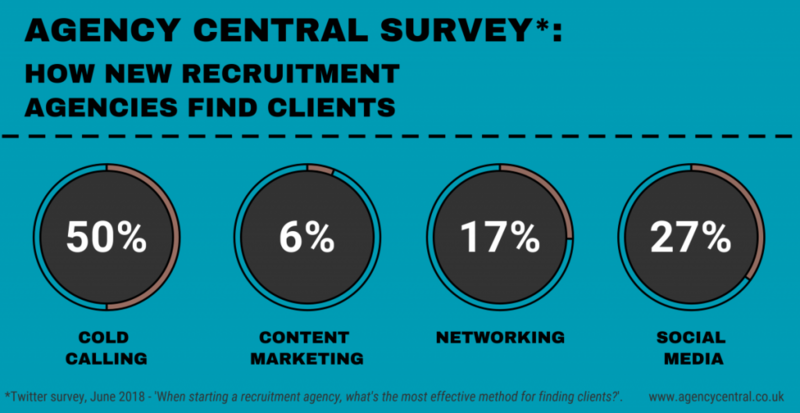 We Asked: How Do Recruitment Agencies Find New Clients? Recently started a recruitment agency? Then you might be wondering about the best way to generate leads. To find out, we went straight to the experts and surveyed recruiters who have been in your position before. So if you’re looking for some new business development tips, read on and learn how recruitment agencies get clients. To discover how a recruitment startup finds clients, we surveyed recruiters who, at some stage in their career, have launched an agency. Specifically, we wanted to know what they felt was the most effective method of sourcing leads in the early days of starting a business. But what did our survey reveal? Surprisingly (for reasons we’ll go into), cold calling came out as the most popular way to find clients. Exactly half of our respondents preferred picking up the phone, 23% more than any other method. Digital marketing channels (social media and content) made up 33% of the vote in total, although only 6% seemed to favour content production – perhaps owing to the time required and the challenges of measuring ROI. Finally, networking is still proving to be effective in winning business when starting out. 17% of our recruiters supported this, showing that recruitment still (and always will) rely on who you know. So now we know what recruiters think, let’s delve a little deeper into each of these client sourcing methods. Should you cold call to find clients? Cold calling divides opinion in the recruitment space. While many agencies have built business around it, others struggle to justify the investment. But just what is cold calling and is it ever necessary? What is cold calling in recruitment? Cold calling is the process of contacting prospective clients in the hope of selling your service. These prospective clients won’t be expecting your call, but may be interested in what you have to say. The issue arises with the fact that cold calling has always been considered a numbers game – both in the volume of people you contact and the number of times you contact them. This means that the cost can ultimately be quite high, especially when the success rate of cold calling (to get an initial conversation at least) is between 1%-3%. When should a recruiter cold call? So new agencies should probably resist blanket cold calling, but that’s not to say there’s no place for ringing up businesses without invitation. Natasha South, Operations and Marketing Manager at Camino Partners, believes cold calling can bring value to a business – if done correctly. She told us: “I think cold-calling is always an interesting subject and ultimately depends on how you define it. If cold calling is finding any old number and hoping for the best, it is almost completely ineffective. In other words, if you see a vacancy that you genuinely think you have the right candidate for, or there’s another way you believe you can bring something to an employer, then a cold call might be beneficial to both parties. However, if you’re spending more than a third of your time chasing leads on the phone, then you should probably divert some of your efforts elsewhere. If you want to find out more about this, we wrote an interesting article that compares cold calling with social media selling. By now, I’m sure you’ve heard that ‘content is king’. In fact, Bill Gates coined this phrase way back in 1996, but the old adage certainly still applies to businesses looking to reap the benefits of digital. 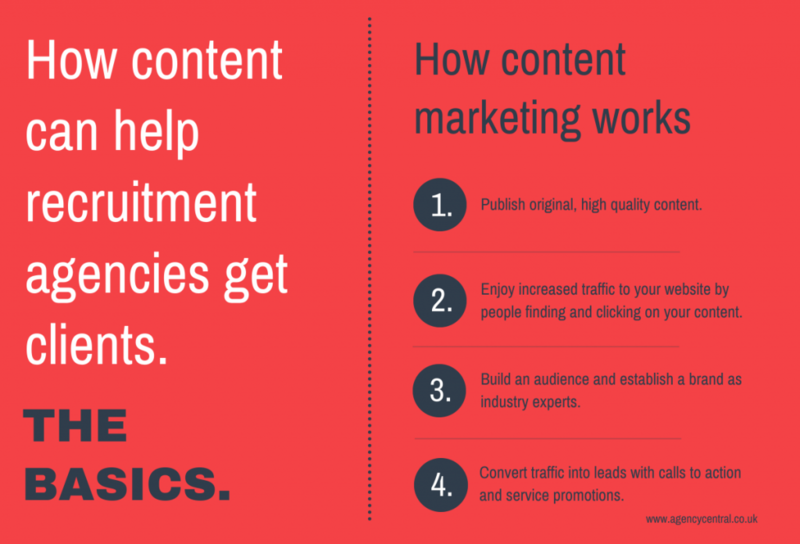 The problem with content marketing is that it’s tough to measure success. This can make it difficult to justify if you’re a recently launched agency that’s looking after the pennies. The purpose of content marketing is to increase brand recognition, loyalty and traffic to your site. All these things are a cocktail for getting new clients, with content marketing reportedly resulting in three times more leads than outbound marketing (including cold calling). The key to writing content that achieves all these things and converts? Quality. Okay, some may argue that ‘quality’ is subjective, but a quick online browse will show that content standards vary massively. ‘Good’ content is content that is helpful or interesting, but also adds something new. It’s this last point that tends to trip up businesses. Say you decide to write a blog post about ‘how to write a job ad’ – how is your blog post going to differ from the 87,000 results that appear for that search? Does it use data? Does it include infographics? Does it offer a new perspective? Is it just a re-word of all those other articles? If you want content marketing that gets clients, invest time into producing high-quality content that’s different to what’s already out there. This is beneficial for both social sharing and SEO (how you rank on Google). Is traditional networking still relevant? Whether you’re new to the game or an experienced pro, we could all do with a few more contacts. This is where networking can help, a suggestion that’s often met with plenty of eye rolling. Thanks to social media, networking is now largely thought of as an online activity, but traditional methods are still effective in finding business. What are traditional networking methods? When talking about traditional networking, we’re talking about meeting people – in person. Meeting employers face-to-face, or even other recruiters, can build stronger relationships and lead to long-term business. Arguably the best way to do this is to attend a networking event. 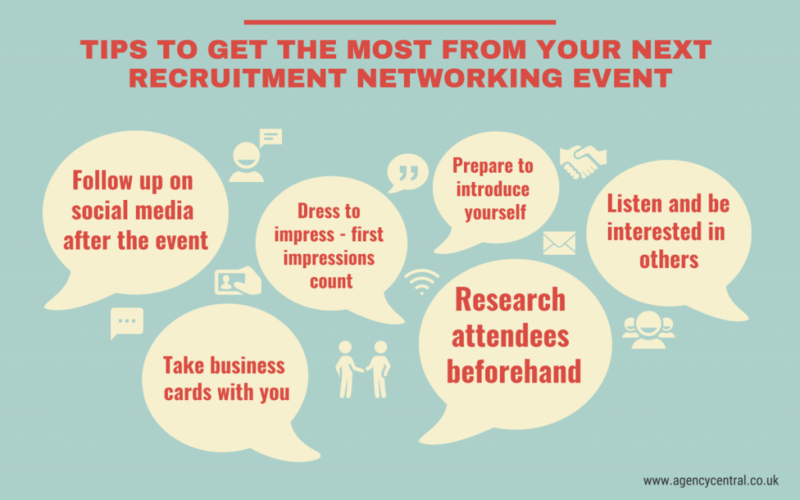 The recruitment industry hosts all kinds of networking events throughout the year, so there are plenty of opportunities to get your face seen. Networking can be daunting, but there are some ways to make sure that you get the most from meeting people – especially at events. Before attending a networking event, it can pay to swot up. From planning what sessions to attend to studying up on other attendees, doing some homework before you go will help you get the most from the day. I hate to break it to you, but not everyone you meet will remember your name (or even that they met you at all). A well-designed business card can change this though, so make sure you’re always well stocked! Once you’ve finally psyched yourself up to attend an event, it can be easy to launch into a sales pitch with everyone you meet. Don’t. Instead, try listening to others and take an interest in what they have to say. You might find this to be more effective in the long run. After meeting and listening to others, they’ll be an opportunity to talk about yourself. You don’t want to sound robotic or overly salesy though, so rather than preparing a pitch, think of ways to casually introduce your agency. Just because the doors are closed, doesn’t mean that the networking is over. Once you’ve met some people and taken some details, be sure to follow up afterwards. Definitely connect with them on social media and maybe even send an email. As hosts of the Social Recruiter Leaderboard, we’ve seen first-hand the growing impact that social media has had on recruitment agencies. Nine out of ten recruiters use at least one social channel, while the online influence of the industry as a whole has risen significantly since we took charge of the board in 2016. But what benefits do Twitter, LinkedIn or even Instagram offer to recruitment startups? How can new recruiters use social media to find clients? When starting an agency, social media can accelerate growth by helping you build a brand and generate leads. “When 360 Resourcing was just starting out, it was just a small team, so making the most of personal connections and digital channels helped us to keep within budget. As we grew, we were able to spend more time on social media to build our brand, and find clients and candidates. In the early days of any business, it’s important to reach out to your market – and what better way to do this than by having instant access to 60% of UK businesses and 84% of individuals. A multifaceted (and well thought out) social media strategy can help you attract and engage with this audience. All of the above can help generate business and build a strong online brand. In fact, when we previously looked at how agencies use social media, 60% of recruiters said their number one reason for using social media is for branding – a necessity when trying to help your new business stand out. Starting a recruitment agency poses many challenges, but finding business is arguably the biggest concern for recruiters. While cold calling won out as the top lead generation method in our survey, agencies that take a more balanced approach will likely have the most success. If you’re looking for an easy way to find clients, why not visit Agency Central? We’re a business development tool that helps recruitment agencies connect with employers and job hunters.